A recent study has found that the social environment of mother quails has a direct influence on the growth and the behaviour of their young. The research was performed by Floriane Guibert and Cecilia Houdelier at the CNRS-Universite de Rennes 1 in France, together with researchers at the INRA in Nouzilly, France and with Austrian scientists including Erich Mostl of the University of Veterinary Medicine, Vienna. While many have known for a long while that disruption of the birds' social environment causes them stress. 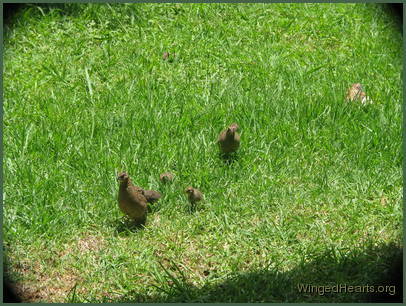 The researching team has shown that changing the composition of groups of quails housed together causes the birds to behave more aggressively towards one another. The level of steroid hormones (corticosterone) in their blood also increases when their group composition is disrupted. When the mothers were subjected to social stress of this kind the eggs they lay were found to have significantly higher levels of testosterone. These results are consistent with previous findings from other groups, which showed that House sparrows, American coots and Common starlings lay eggs with more testosterone when they breed in dense colonies than when they nest in isolation. But the new work has also shown that the eggs of females under social stress hatch later and the chicks grow more slowly after hatching, at least for the first three weeks. 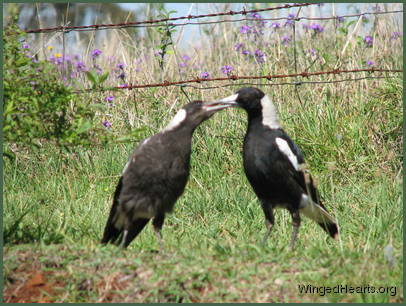 We've noticed with magpie and butcherbird clutches that when our mother birds friends Vicky (see top picture where baby magpie Wendy is being fed by mother Vicky magpie), Harrie & Butchie have been going through a period stress they eggs hatched much later than their counterparts across the valley and their chicks were also slower in developing. The stress can be caused through harsh climate, strained relations with neighbouring clans, death in the family of a child, or partner. Once when we were away for five weeks during their normal breeding period, even though we had organised carers to refresh their water bowls and feed them once a day (so they would not go without in the winter drought), our bird so stressed by our absence that they delayed having their clutch till after we returned. Their joy and relief at seeing us return was unmistaken.